Home » Davinci Labs JOINT SUPPORT FOR MEDIUM & LARGE DOGS 45 Sugar Free Chicken Liver Chews 8.73 oz. 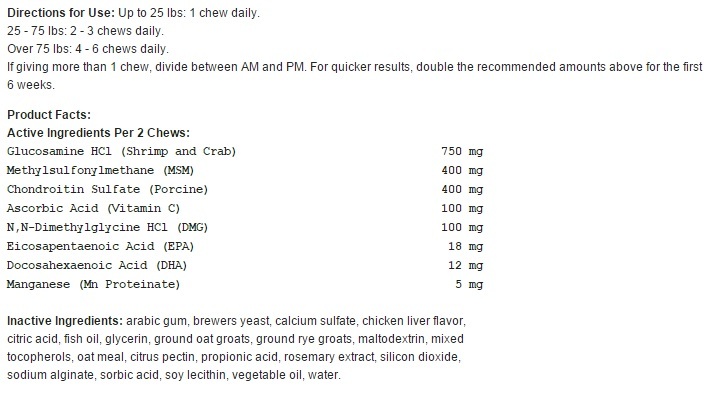 Davinci Labs JOINT SUPPORT FOR MEDIUM & LARGE DOGS 45 Sugar Free Chicken Liver Chews 8.73 oz. Give those squirrels another run for their money. Our Joint Support Formula has high quality ingredients that are properly balanced for optimal results. Inactive Ingredients: arabic gum, brewers yeast, calcium sulfate, chicken liver flavor, citric acid, fish oil, glycerin, ground oat groats, ground rye groats, maltodextrin, mixed tocopherols, oat meal, citrus pectin, propionic acid, rosemary extract, silicon dioxide, sodium alginate, sorbic acid, soy lecithin, vegetable oil, water. Directions for Use: Up to 25 lbs: 1 chew daily.